With the weather turning cold we're eagerly waiting for the white stuff to fall, but sadly there doesn't seem to be that much of it at the moment. 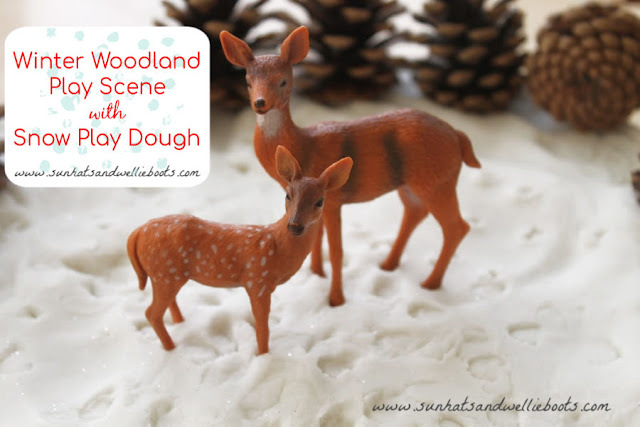 So we're creating our own with this Winter Play Scene & Snow Play Dough. 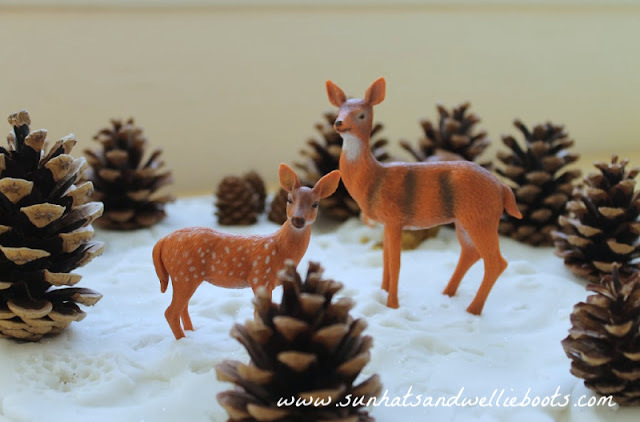 If you're looking for a seasonal play set up then this sensory activity is ideal & great for exploring winter woodland animals too. This is such a simple play set up to put together, & one which can be easily cleared away & used again & again. I've used this several times now & the children have always loved exploring it. :: Add one cup of water & mix well, then slowly add the other cup of boiling water until you get your desired consistency. :: Knead well on a clean surface until the dough feels soft. :: To give our Snow Dough a glistening effect we folded in a handful of glitter. For our play scene we used a large tray, & then added some pine cones along with our play figures. We chose to add woodland animals, some of which were old Christmas decorations, others we've collected over the years. 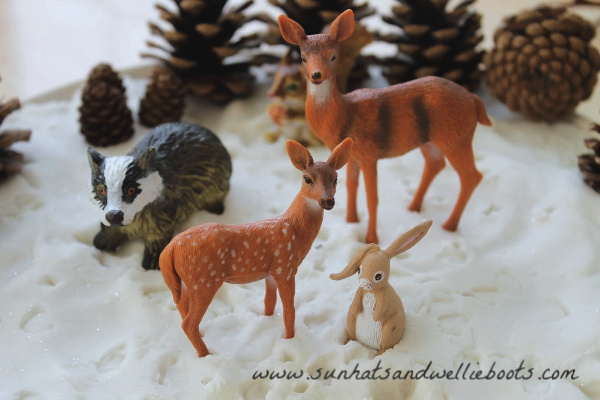 If you're looking for a set of similar woodland animals then these would be great for this activity. 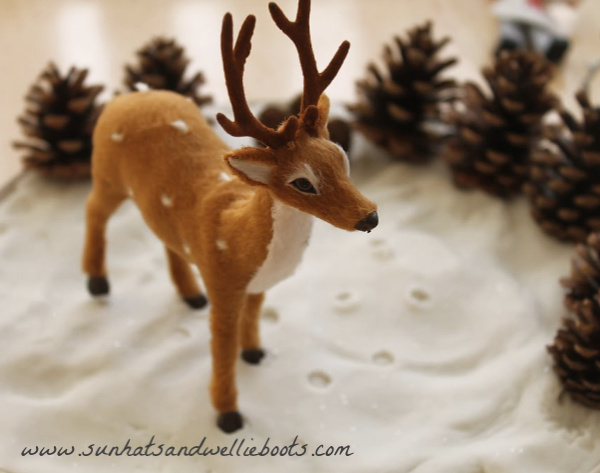 We flattened our snow dough onto a tray to create the base for our scene, keeping a little back to create with later. Then around the edge of the tray, we added our pine cones which used as trees, & our snowy Winter scene was ready to be explored. As we added the animals & as they 'walked' over the dough we noticed they left tracks in the snow. 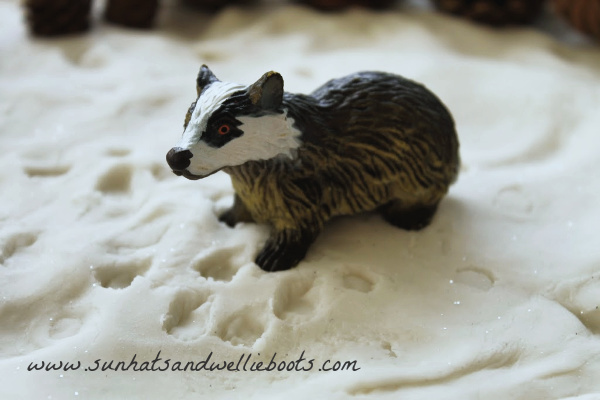 The different sized paws & hooves of the animals created a variety of prints & patterns to discover in the snow, & the children loved guessing which animal had left which set of tracks. A simple way to explore & compare shapes, size, pattern & numbers. The children enjoyed covering the imprints up & creating more animals tracks as they took the animals on adventures around the snow. We also discovered that the pine cones made beautiful flower shape patterns in the snow too. So much imaginative play & descriptive language has been inspired by this snow play, & it's been a joy to listen to all stories & adventures being shared. It also inspired some great teamwork too. As the children explored the play scene we were able to talk about which woodland animals are around during different seasons, & which animals hibernate during the Winter & why they might do so. This sparked lots of conversations which led us to think about nocturnal creatures & different habitats too. Such a simple play scene to put together, but one that sparked so much fun, imagination & discovery. Here's hoping we'll have real snow to play with soon too. 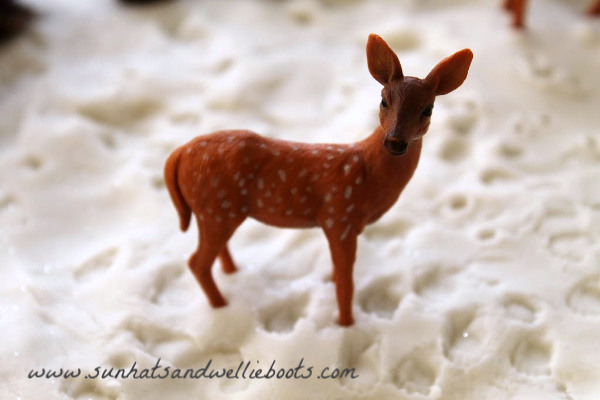 Looking for more Winter activities & crafts? You might like these.